People in the United States take their BBQ very seriously. While other countries have their own versions of barbecue, American regional styles are very unique. Every barbecue lover has a favorite style that they prefer, whether it is the type of meat or sauce or how it is prepared. Here are the 7 most popular BBQ styles and how Baltimore BBQ compares. There are two popular styles in North Carolina. The “Eastern Style” consists of a chopped whole hog barbecue that is typically served with a vinegar and pepper sauce. What really makes it unique is that it is served with the pig skin which adds texture to the sandwich. 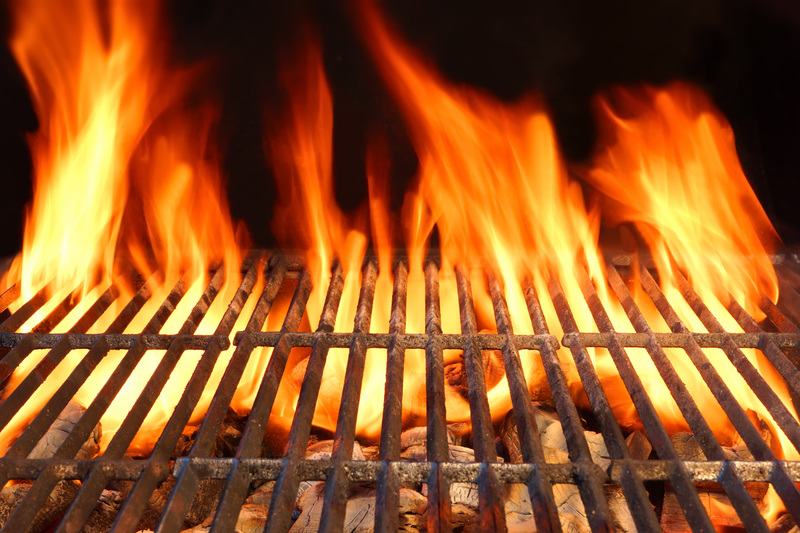 The traditional way to barbecue is using wood. In the western part of the state they prefer a different BBQ style called the “Lexington” or “Piedmont Style”. This style is all about pork shoulder served with a red barbecue sauce. It is cooked just right with caramelized glaze on the shoulder. The “South Carolina Style” has been made famous by its special mustard-based sauce called “Carolina Gold” which came from the area’s German immigrants. The meat of choice in this area is pork. Memphis is the center of barbecue in Tennessee and is known for both “dry” and “wet” pork ribs. The area is also known for its pulled pork shoulder that is served with a tomato-based barbecue sauce and for adding pulled barbecue into surprising dishes like spaghetti and pizza. Kentucky does barbecue a little differently preferring to cook up mutton and add a Worcestershire sauce-based dip that was born in the town of Owensboro. In the Texas Style, brisket is usually the meat of choice and it is slow cooked for 20 or more hours in a smoker. The sauce is made of the drippings from the meat and the different condiments. With this style, the fat is not removed before the sandwich is served unlike with Baltimore pit beef where the fat is always cut off. Alabama specializes in a pulled pork or chicken sandwich filled with Cole slaw, but what makes it really unique is the white sauce made of a mayonnaise-and-vinegar mixture. This hot bed of barbecue pulls in influences from other regions and will cook up different types of meat. The most popular sauce style is a sweet tomato based sauce with molasses. How Is Baltimore BBQ different? In Baltimore when you say barbecue what you really mean is Baltimore pit beef which basically is bottom round flat cooked over an open charcoal pit in a quicker manner than other styles of barbecue like the Texas Style. Baltimore pit beef is crusty on the outside and juicy and almost rare on the inside. The meat is shaved into thin strips and heaped high on a sandwich. People come far and wide for a Baltimore pit beef sandwich. Brisket is the favorite in a lot of the other styles. Baltimore BBQ has a distinctive flavor that you can’t get anywhere else. The bread also adds to the tastiness of the sandwich. Pit Beef is served on a Kaiser Roll or rye bread which give an earthy flavor to the sandwich. What else makes this such a signature Baltimore dish is the sauce. Unlike other regions which use a mix of ketchup, brown sugar or vinegar to give the meat its flavor, the sauce used with Baltimore pit beef is a tiger sauce that is a combination of horseradish and mayonnaise which keeps the customers coming back for more. 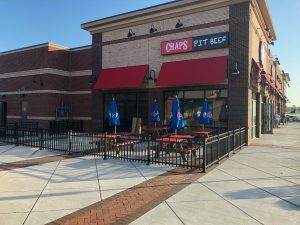 One restaurant in particular, Chaps Pit Beef, exemplifies the “Baltimore Style BBQ” and is one of the pioneers of modern day Baltimore pit beef. With locations in Baltimore on Pulaski Highway and in Aberdeen on Beards Hill Road, they have created a strong following of patrons and restaurant critics alike. Chaps “Baltimore Style BBQ” method is what made their original pit beef sandwich so famous. To make a Classic Pit Beef sandwich, Bob uses a bottom round roast flat cut from the hind quarters which are a tougher, but more flavorful cut. He trims the gristle and silver off the meat and then applies a dry rub of different herbs and spices like paprika, salt and peopper, thyme and onion powder. He then lets it sit over night and in the morning he puts it on an open pit of burning hardwood charcoal that gets to gets to about 400 to 500 degrees. Once the beef has a nice crust on the outside and is tender on the inside, he slices it in ribbons and puts it back on the pit so he can cook to order for each of his customers. He always make sure to spread the meat around to add some char and flavor to it. Next he shaves the meat and piles it high on a kaiser roll and adds whatever fixings the customer wants, including Chaps’ special tiger sauce. Your food is always cooked to order. 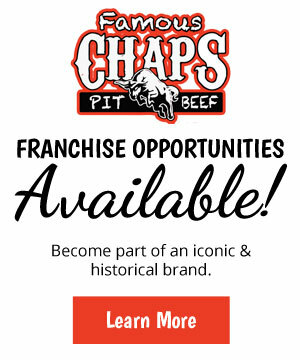 Want to know more about Chaps Pit Beef and what makes pit beef sandwiches so popular, contact Chaps Pit Beef today.